5HRAAUW: 6.0 volt 1650mAh rechargeable Ni-MH AA-size receiver battery packs. 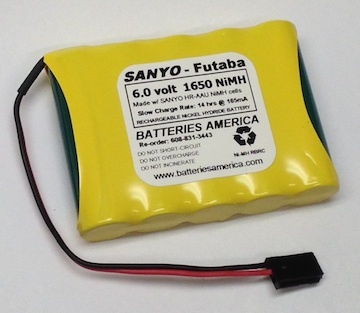 Made with HR-AAU 1650mAh AA-size Nickel Hydride cells. These cells are the same dimensions as standard Rx packs, but provide much longer operating time. Choose shape, and choose wire leads or Connector from the menus. $23 base price is for 6v pack with wire leads. Connector is $3 extra.